Finally we had shopping. It&apos;s 6:30. I have to prepare. I wear the beautiful blue dress. I put lip gloss on my lip. I put foundation on my cheeks. I went out. “Chris will like you. "KC said. “I don&apos;t know." I said. Then the doorbell rang.“I think it&apos;s him. I will hide. Go out. Good luck with your first date,"KC said.“It&apos;s not a date." I said. I opened the door. “Hi," I said nervously.“You look great,"Chris complimented.“Thanks," I said.“You should sit beside me,"Chris said. Chris opened the door of the taxi. I get in. Chris is sitting next to me. “Are you okay? "Chris asked.“I&apos;m nervous," I replied. Chris held my hand. Did I ever thought that after 6 years this will happen? It&apos;s my first day at New York. I will take my first dinner at New York with Chris Colfer and Darren Criss. “Where do you want to eat? "Chris asked.“Spotlight diner." I replied. I haven&apos;t heard Darren&apos;s voice.“Okay,"Chris replied. We&apos;re still heading to Spotlight Diner. “Darren is not speaking, Chris." I whispered.“Did someone called my name? "Darren asked.“No. "Chris replied. He&apos;s still holding my hand. I can&apos;t breathe.“Hey. "Chris said.“Why?" I asked.“I&apos;m worried about you. Are you thinking about something? "Chris said.“No." I lied.“I know you. "Chris said.“I&apos;m not trying to hide something. I&apos;m just waiting for the perfect time to tell it." I said. “Are referring to your secret? "Chris asked.“Yes I am," I replied.“I&apos;m not forcing you to tell it now but you have to tell me. Promise? "Chris said.“Promise," I replied. “Your cousin,"Chris said.“What about her?" I asked.“Does she hate me? "Chris asked.“She doesn&apos;t hate you." I replied. “I think here we are. "Darren said. Darren opened the door of the taxi. Then I went out. “This is Spotlight Diner. Huh?" I said.“Come on. "Chris said. So we went inside Spotlight Diner. We sat in the couch. Chris called a waiter. The waiter took the order. The waiter walked away. I saw some girls giggling and they&apos;re looking at Chris. They asked if Chris could come with them and Chris agreed. Darren and I was left at couch. “Do you like Chris? "Darren asked.“No." I lied.“I know you&apos;re lying. "Darren said.“I&apos;m not." I said.“If you don&apos;t want to tell the truth, I will tell them right now that you love Chris. "Darren warned me. “I like Chris. Happy?" I said.“I knew it. By the way I&apos;m Darren Criss. "Darren laughed.“I knew you. I&apos;m a big fan of yours." I said.“So that&apos;s your secret? "Darren asked.“Yes but please don&apos;t tell him about it." I said.“I will,"Darren promised. “Chris is correct. You&apos;re sweet and adorable. "Darren said.“Thanks for the compliment." I said. I saw Chris walking. “What did I missed? "Chris asked.“We&apos;re talking right now. "Darren said.“Good. "Chris said. Then Chris sat. “Why did you picked Spotlight Diner for dinner? "Chris asked.“To be honest, it&apos;s the only restaurant that I know in New York," I replied.“What?! 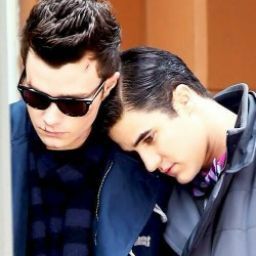 "Chris and Darren said shockingly. “I don&apos;t live at New York. I just got here today." I said.“So you took your first dinner in New York with us? "Darren asked.“Yes and it&apos;s weird," I replied. “Can I take your cousin&apos;s number? "Chris asked.“Yes you can." I replied. I gave KC&apos;s number. “Where do you live before going to New York? "Darren asked.“Philippines," I replied.“So how&apos;s your first day in New York? "Chris asked.“Unbelievable," I replied.“Why? "Chris asked.“Because at my first day in here, I met my favorite couple on Glee," I replied. “You still love Klaine? "Darren asked.“That is the reason why I went to New York," I replied.“I can&apos;t believe that they&apos;re still Klainers out there,"Chris said. “I&apos;m making a project which is named “The Klainers&apos; Dream Project 2014-2020". This is a project for Klainers to meet Chris Colfer and Darren Criss personally." I introduced. “A tour? "Darren replied.“Exactly. I have selected thousands of them," I replied.“Where&apos;s the first location? "Chris asked.“Vietnam," I replied. “Who are we visiting there? "Darren asked.“My best friend, Kien but we call him Hund because that&apos;s what he want." I replied.“Is this person a boy or a girl? "Chris asked. “He is a bisexual." I replied. “Where did you met him? "Darren asked. “I met him at Twitter. I DM him and we talk and talk all night. It was like I met him several years ago," I replied.“Interesting story,"Chris said. “How&apos;s the career?" I asked. “It is great,"Darren replied.“Same here,"Chris said.“Here&apos;s the food," I said. Then the food was served. “So this is what New York tastes like." I said.“You&apos;ll get used to it,"Chris said.“When will be the start of the tour? "Darren asked.“After getting the shake house done." I replied. “You&apos;ve got many dreams,girl,"Darren said.“My cousin and I planned that Glee stars will be there. It&apos;s time to relive the music. I miss Glee," I said. “We will help you to make your dreams come true. "Chris and Darren said.“I also want to make a book after the tour. It is all about our tour around the world," I said.“You&apos;re so awesome,"Chris said.“I just wanted to prove that dreams do come true," I said. “Have you taken college? "Darren asked.“No, I&apos;ve just finished high school," I replied.“When is your birthday? "Chris asked.“On May 8," I replied. “That&apos;s awesome,"Darren said. “What do you want to do on your birthday? "Chris asked.“By the way I&apos;m turning 18. When I was 12, I wanted Glee stars to be there. That&apos;s what I always wanted," I replied happily. “Why are you always including me on your plans? "Chris asked. Darren and I was starring at each other. “My plans won&apos;t work without you," I replied. “So sweet,"Chris said.“How about me? "Darren asked.“Don&apos;t be sad you&apos;re also involved," I replied. “So this is what it feels when you&apos;re hugged by a star?" I asked.“Don&apos;t call me a star. We are your friends now,"Darren said.“Really?!" I said shockingly. “You&apos;ve almost told us everything,"Chris said. Then Darren gave his number and I also gave mine. “Thanks for the number," I thanked.“My pleasure,"Darren said.“When is the making of the shake house? "Chris asked.“When I finally got a job," I replied. Chris and Darren are talking about something. “You have a job now,"Chris and Darren said.“What job?" I asked.“You&apos;re now officially our assistant,"Chris and Darren replied. Then I hugged them both. Everybody in Spotlight Diner started clapping.“This is too much," I said.“You deserve it,"Darren said. Then I started crying. “Why are you crying? "Chris asked. I didn&apos;t answer. I hugged him and he hugged me back.“Finally you&apos;ve been hugged by your.."“Darren.." I interrupted. “Darren are you hiding something?" Chris asked. “Yes,"Darren replied. “What is that? "Chris asked.“It&apos;s my secret, Chris," I interrupted. “I think I should go. Bye," I said. Then I went out of Spotlight Diner. 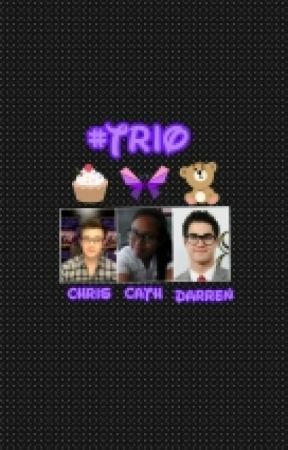 My hands were held by Darren and Chris.“We will walk with you," Chris and Darren said. Part 3 over. Love is in the air, Catherine. I bet Darren will tell Chris tonight the secret. I hope you enjoyed it.